Experience superb fly fishing accessible by horseback and mule pack – string only, hard to get to, but impossible to forget. We provide one on the most affordable, memorable and scenic horseback excursions in the Rocky Mountains. Having been in the professional outfitting business since 1979, we have consistently restricted our services to clients seeking a high quality and personalized outdoor experience. 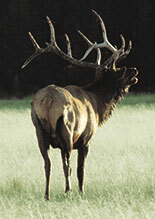 We are one of the most trusted, full-time, Southwest Colorado Big Game Outfitters. T Bar M Outfitters offers remote high country Colorado Elk Hunting, Mule Deer Hunting, Black Bear, Bighorn Sheep, Mountain Goat and Moose. We specialize in all methods of hunting: Archery, Muzzleloader and Rifle. Our Summer Fishing Trips are second to none. We fish for cutthroat, brook, rainbow and brown trout in numerous alpine lakes and streams. You can explore Anasazi Indian ruins over one thousand years old and ride through canyons sculpted by immeasurable time while enjoying one of our summer horseback excursions. We operate in the San Juan National Forest and the Weminuche Wilderness. Whether you're looking to go hunting, fishing or on a summer horseback trip, we'll help you have a successful adventure! Please choose your area of interest by clicking one of the buttons above or links below. For more information complete our contact form and then browse through the remainder of the website. Our guides and wrangles are all extensively trained not only in hunting and horseman skills but in First Aid as well, for your safety and peace of mind. We provide you with the most comfortable and up-to-date camping gear. We fish areas off the beaten path that do not receive pressure from the general public. Our wilderness horseback fishing trips are based in the Weminuche Wilderness Area. Our Horseback adventures start in April with our Utah Canyonlands Trail Rides, located in Southeast Utah. In June we begin our High Country Colorado Pack Trips. T Bar M Outfitters knows that earning your trust means doing a complete and thorough job and providing you with a trip of a life time. This may seem like a tall order but we do everything in our power to provide a safe and enjoyable experience. T Bar M Outfitters has served southwest Colorado since 1979, we have over 40 years of experience in the hunting industry and our repeat clientele is over 90%. (References provided upon request) We are committed to providing you with the best guides, equipment, livestock, accommodations and the best hunting experience that Colorado has to offer. Your satisfaction is our main priority.